Mick Schumacher, the 17-year-old son of stricken Formula 1 legend Michael, won two races on his Italian Formula 4 debut at Misano on Saturday. The first of his pair of victories came from second on the grid, while he overcame torrential rain to win again in the following round. Mick will head to his native Germany next weekend to race in the German F4 tournament at Oschersleben. He finished 10th overall in the Germany championship last season. Frederic Vasseur believes the Renault Sport F1 Team is not so far from Williams in terms of race pace and that the squad should be able to score points in China, providing they have a completely mistake-free weekend. “Honestly, I can say I am impressed [with what I have seen so far]. The push and drive from the team is strong,” Vasseur said. “We are generally where we expected to be, but equally some way short of where we all want to be,” he added. “We know it’s a long term project, but that doesn’t mean we will sit back. I want everyone fighting as hard for the position in front whether it’s P10 or P1. That’s how we’ll regain the success we want. “We have finished both races so far as the first car outside of the points so inside the points is where we need to be. “I haven’t got to be a triple world champion just through luck. There’s a reason I can [have] that number of race wins. I prepare at home before in my room, or on the flight. “Do I enjoy my life? Absolutely. You can call it as you want. All people are different. It’s good when a character is unique. “There are still far too many people who think that they have to adapt to be accepted. With back-to-back points finishes, Romain Grosjean says those who thought he was committing “career suicide” by moving to Haas have been proven wrong. Grosjean made an incredible start to Haas’ debut campaign, racing from 19th on the grid to sixth at the chequered flag in Melbourne. Two weeks later he showed that it was not a fluke result. The Frenchman qualified P9 in Bahrain and under the lights on Sunday finished an impressive fifth, vindicating his decision to leave Lotus for newcomers Haas. “Some people said it was career suicide. I think they were wrong. Sorry guys,” he told Reuters. He added: “I said in winter testing we could score points early in the season. It so often happens that you have to quack like the majority, indigenous segment of the population you’re surrounded by before people stop pointing fingers at you… There seems to be a vocal segment of the F1 world who won’t stop ridiculing and flaming Hamilton it seems for refusing to clone every single aspect of the average behavior of the indigens…. For mine, I’m not sure Lewis quite said what he meant. I’d suggest it’s a rolled-gold *fact* that far too many people have to adapt if they want acceptance and I’m certain that this situation is a sad state of affairs. Going along to get along, doing the done thing and keeping quiet when you don’t agree will generally get you accepted, but is that what you really want? Doubt it. Is it a positive thing? Nope. Sadly this is the case for far too many people. Lewis evidently doesn’t feel “accepted” by the F1 circus crowd because of the lifestyle he leads when away from the track. I doubt that this lack of acceptance will change any time soon. But it would seem he’s cool with that situation, which is, ultimately, the moral victory and what he wishes for those in similar situations. Breaking out of the bubble will rarely get you accepted. Respected, perhaps, if you’re lucky, but not accepted. Acceptance is something that can only be bestowed by “the mob” and it’s collective mentality. You gonna wait for that? Or just do your own thing and flip ’em the bird? hahaha. I remember The Judge heavily chastising a commenter for quoting Planet F1. and yet, here we are … highly laughable IMHO. To me, it depends on the content: even the worst sites / tabloids have journalistic standards and if they write quotes, these are generally true. Richard Bach: I’ll quote the truth wherever I find it, thank you. What has TJ13 become? Just another search engine? I think this pretty much signals the end of this site. And please not another Schumacher. The last generation nearly finished me for good but I’m still here. The last thing we need is spoilt brat Verstappen battling against spoilt brat Schumacher. Daily News and Comment feature is purely for readers to comment on well known quotes gathered the previous day. We’ve brought forward our new youtube show so we’re still putting forward new and alternative content, particularly when compared to other F1 sites. Actually, it should have read “when compared with other F1 sites”. But hey, no need to be pedantic. Yeah well verstappen has a son in f1. Now the shoe is on the other foot as they say! “Now the boot is on the other Schumacher”! Who me sir? I would do no such thing as dear to criticise our dear Lord Schumacher. the above two should keep in mind that they are talking about the most Successful formula one driver ever up to this day. 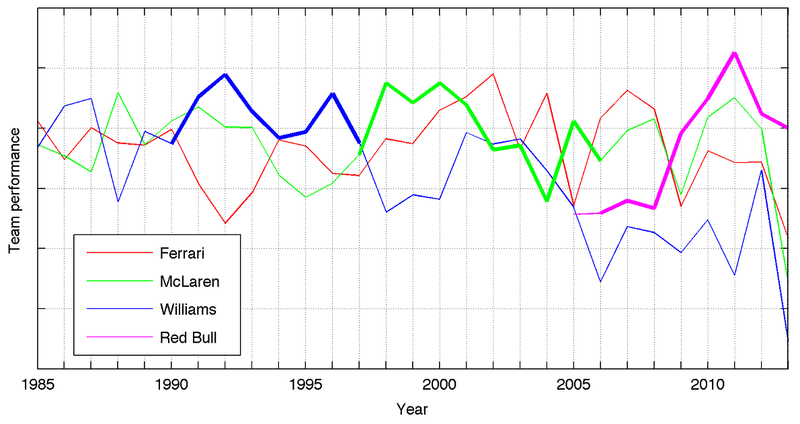 The carefully calculated statistics at F1 Metrics would politely disagree with that assessment of MSC’s F1 career. Any knowledgeable follower of the sport, whether a Schumacher fan or not, knows fine well that he benefited from a lack of decent competition in the Ferrari years. Mika Hakkinen’s early retirement from the sport severely impacted on MSC’s closest competitor, through a misguided belief that new blood such as Kimi, was capable of keeping Michael honest. Plus before he became the absurd meglomeniac now diverting the FIA away from motorsport in pursuit of his own deification – Jean Todt inflicted his unsporting ways during his Ferrari tenure, to further enhance the magnificent statistics credited to MSC. The way Todt ran that team effectively means another driver should be credited in respect of Schumacher’s technically individual achievements. 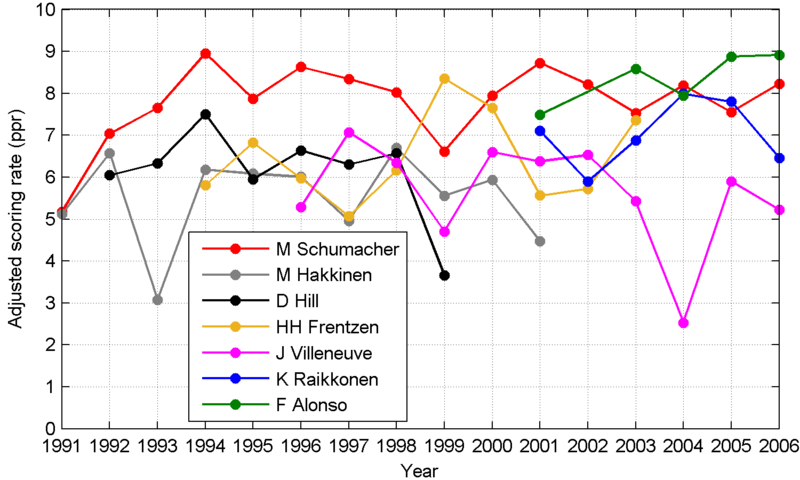 The model awards Schumacher the championship each year from 1993-1998, 2000-2002, and 2004. Vandoorne in Brussels today and alonso in shanghai. Should we conclude that he’ll be back in the car? I suspect so. Surely preparation is key for him given his lack of time in the car, thus if Stoff was going to drive I would have expected he rather than Fernando to already be in China.